IE10 is installed with Windows 8 so, until it’s available for Windows 7, it’s not possible to determine whether you’ll encounter installation or compatibility issues. But you should note that Windows 8 is refreshingly quick and simple to install — 30 minutes of hard-disk chugging will have you up and running. As you’d expect, IE10 is the default browser although Windows 8 will retain your current preferences if you’re upgrading. Those in the EU will also be offered the infamous browser choice screen where you can select Chrome, Firefox, Opera or a selection of little-known alternatives. Safari has disappeared following Apple’s decision to scrap the Windows version. The most exciting news is that Microsoft has finally implemented automated updates. It’s on by default so let’s hope large organizations keep it that way when they get around to deploying Windows 8 in 2026. The Metro version offers a sleeker, simpler UI with the same underlying rendering engine. It supports gestures such as swiping which makes it ideal for touchscreen tablets and large TVs. I’m not convinced you’ll use it much on a PC, but that’s partially because the Metro version can only be used when IE is set as your default browser. 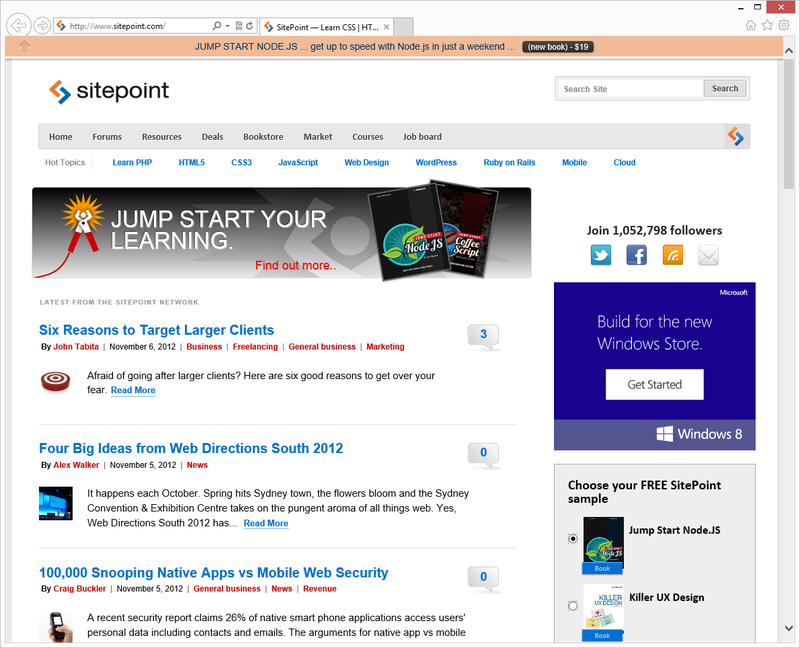 IE10 and Windows 8 integration is as good as IE9 on Windows 7. The browser supports UI features such as pinned sites on the Metro start screen or taskbar, jump lists, peek and window snap. 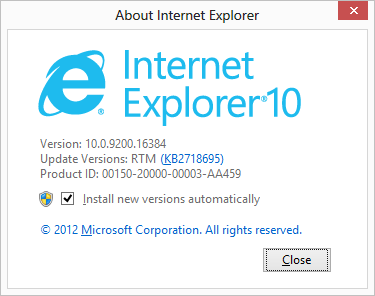 Overall, IE10’s interface is functional and keeps out of the way. It may not be as attractive as Chrome, Firefox or Opera, but you rarely notice it. My only complaint is the Internet Options dialog which has barely changed since IE4 was introduced 15 years ago — it’s confusing, overly technical and needs an overhaul. That said, it finally allows you to start with the tabs opened in your previous session. IE10 supports the modern HTML5 web features you’ll find in other browsers. This finally includes text-shadow, transforms, and animations. My Star Wars 3D Scrolling Text works! The only exception is WebGL which Microsoft has identified as a “security risk”. While I’m slightly skeptical about that claim, the technology is not currently viable in anything but browser-specific games and demonstrations. It may depend on your PC, settings and personal preference, but IE’s text seems more readable than competing browsers. In essence, Microsoft has created a modern browser which shouldn’t pose the development challenges we experienced with its predecessors. I’m yet to find a site which fails in IE10. Benchmarks do not necessarily reflect real-world usage, but I was surprised how badly IE10 performed (and how well Firefox fared). It’s possibly caused by something quirky occurring on my PC, but the browsers were tested on a clean Windows 8 installation with no other applications running. IE10 does not feel slow and certainly starts quicker than Chrome or Firefox, but Microsoft’s browser has lost ground to others since IE9 was released. Few people worry about browser memory usage but I wanted to ensure IE wasn’t hogging the system. With four tabs open, the worst performer was Chrome with approximately 350MB (split across a dozen processes). IE10 consumed two-thirds of those resources with 240MB although, admittedly, Windows 8 could be running other background processes. The least-hungry browser was Firefox with 195MB. Enhanced Protection Mode isolates each tab. InPrivate browsing is isolated per tab rather than per session. Random memory addresses are used when IE loads modules. Microsoft’s SmartScreen download reputation service is used within IE and Windows 8 so you remain protected regardless of which browser you use. As I reported last month, “Do Not Track” is enabled by default when you install Windows 8. This has upset advertisers, but few adhere with DNT guidelines so you’re unlikely to notice any difference. IE10 installs a performance-enhanced version Flash and, contrary to earlier reports, it works in both desktop and Metro modes. However, IE’s selection of add-ons remains disappointing. Despite being one of the first browsers to support plug-ins, few companies develop for the browser. Those who do usually offer spammy shopping or search toolbars. Microsoft needs a different model if they want extension builders to take IE seriously. Adopting plug-in technologies similar to those used in Chrome, Opera or Firefox Jetpack would make a big difference. IE10 provides the same F12 Developer Tools as IE9. It’s better than nothing, but increasingly shoddy compared to the Firefox tools, Firebug, the Webkit Inspector and Opera Dragonfly. To be fair, these are practical for testing purposes. Unfortunately, IE10 disables intranet browsing and switches those pages into compatibility mode by default. It’s therefore impossible to test a site hosted on your local machine. You can get around this restriction, but it’s a little quirky — watch out for an article coming soon. Ultimately, Microsoft has few excuses. They cannot expect developers to flock back to IE without providing a good selection of tools. I hope they concentrate on those facilities now less urgent work is required on the Trident rendering engine. IE10 is a good, capable browser. It’s fast and offers the majority of HTML5 and CSS3 features we find in Chrome and Firefox. IE10 has caught other browsers — but it’s not better. Considering the 19-month development period and radical changes in Windows 8, I was hoping for a little more. Users will like IE10, but I doubt they will love it. Microsoft may slow the rate of Internet Explorer migration, but IE10 offers few compelling reasons switch from another browser. If you enjoyed reading this post, you’ll love Learnable; the place to learn fresh skills and techniques from the masters. 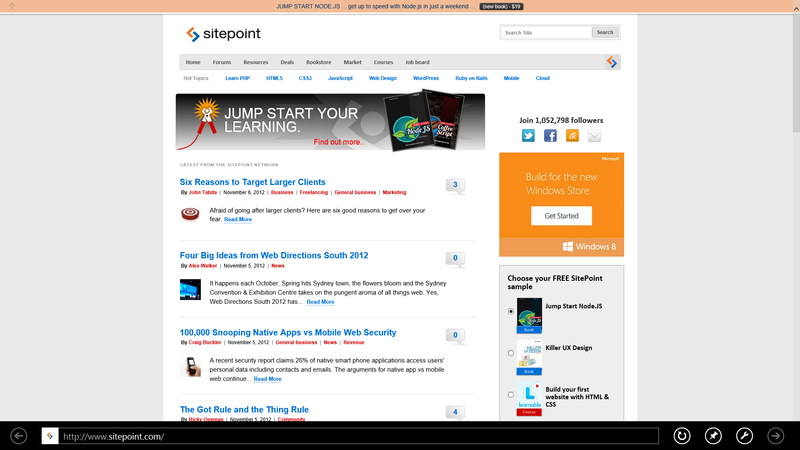 Members get instant access to all of SitePoint’s ebooks and interactive online courses, like Build Your First Website: Getting Started with HTML and CSS.